Buy these fantastic Wool blend golf socks from Glenmuir for warmth and comfort that lasts the course! Wool is an extremely warm material which is great if you are out on an open course with the wind rattling across the fairway! Tradition features high on the list of reasons why dedicated golfers will want these Glenmuir Birkdale Golf Wool Knee High Socks as part of their game wardrobe. These traditionally designed, crafted and UK-made socks use the finest cotton rich blend to create the breathable yet warm feel and deep-ribbed heavyweight weave. 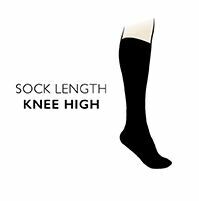 In a full length leg, with versatile turn over top cuff, these golf socks are great for keeping the cold at bay, particularly if you wear them with breeks, plus fours or shorts, for that time-honoured traditional look.